In stock -This product will ship today if ordered within the next 13 hours and 10 minutes. 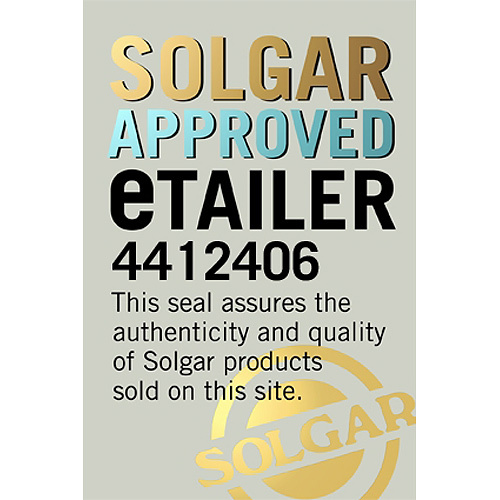 Solgar® Gold Specifics Glucose Factors are part of the Solgar® Gold Specifics premium range of natural formulas created for the support of specific functions in the body based on nutritional science. Solgar® Gold Specifics Glucose Factors contains a wide range of vitamins and nutrients. Magnesium is considered by experts to be a vital mineral required by every organ within the body. It can be recommended for everything from promoting restfulness, supporting muscle function, energy from food and so relieving tiredness, as well as aiding towards a balanced mind. Zinc is a vital nutrient for many functions in the body. It promotes healthy skin, hair and nails and supports normal taste and vision and exerts antioxidant activity, protecting against oxidative stress and can support a healthy immune system. It also has properties that are useful for male health. Vitamin B3, niacin, which is one of the 8 B Vitamins and plays an important role in energy levels, assisting the metabolism and reducing tiredness and fatigue. Vitamin B3 is an essential water-soluble vitamin which can be found in many foods such as meat, tuna, seeds and mushrooms. This specific vitamin supports the body with several processes, ranging from managing energy levels, to skin health and a balanced mind. Vitamin B6 plays an important role in several biological functions, ranging from contributing to metabolism through to supporting the psychological function and immune system. It is specifically known for its qualities of regulating hormones and formation of healthy red blood cells. Most people will be able to reach the recommended levels of vitamin B through their diet, as this essential vitamin can be found in a wide variety of foods such as poultry, fish, seeds, beans and wholegrains. However, cooking, freezing, storing and processing foods can destroy up to 50% of the vitamin B6 content. Chromium is a trace mineral which is required by the body for healthy functioning. This metal can naturally be found in brewer’s yeast, meats, potatoes and whole grains. It can also be found in the soil and then ends up in the crops we eat and the water we drink. Minerals, just like vitamins, support your body to perform many different functions. Chromium plays a role in the metabolism, where it converts nutrients such as carbohydrates, proteins and fats into energy. 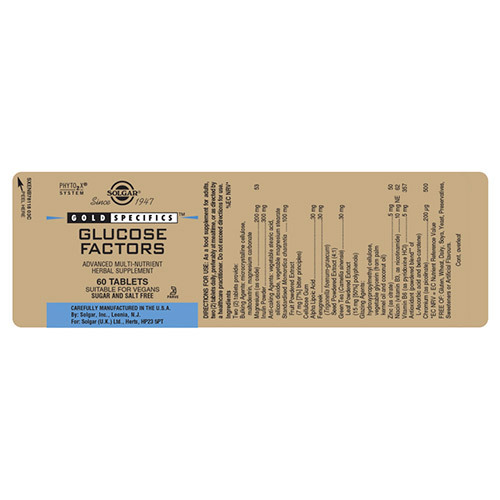 Furthermore is has an important role in balancing blood glucose levels. Inulin is soluble plant, high in fibre, supporting the digestive tract. Momordica charantia is a tropical plant grown in Asia, Africa and the Caribbean, also known as bitter melon. Its fruit is edible and has been used both as food and medicine in the Amazon. American Natives used it for a range of treatments. Alpha-Lipoid Acid is a fatty acid found naturally in the body. It is soluble in both water and lipid based tissues and is sometimes used with vitamins C and E. The body is capable of making a small amount of alpha-lipoic acid on its own but levels increase rapidly by eating foods like green vegetables and potatoes, or by taking a supplement. Green tea has been consumed in Asia, and in particular China, for thousands of years. Green, black and oolong tea all come from the Camellia Sinensis plant. Green tea however is made from leaves which have not been fermented. 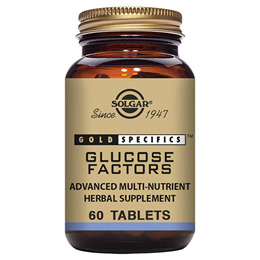 Solgar® Gold Specifics Glucose Factors contains a wide range of vitamins and nutrients. It is to be taken as 2 tablets daily. A special powdered blend of beta-carotene and ascorbic acid (PhytO2X®) has been added to this formula to maintain the freshness of the ingredients. Several ingredients have been combined to support your daily wellbeing. Also contains: Bulking Agents: microcrystalline cellulose, Powdered Extract (0.5mg [0.5%] charantin, 7mg [7%] bitter principles), Anti-caking Agents: vegetable stearic acid, silicon dioxide, vegetable magnesium stearate, Cellulose Gum, Glazing Agent: hydroxyproplmethy cellulose, Antioxidant (powdered blend of beta-carotene prep. and ascorbic acid), Vegetable Glycerin. Bulking Agents: microcrystalline cellulose, maltodextrin, magnesium carbonate. Magnesium, Inulin POwder, Anti-caking Agents: vegetable stearic acid, silicon dioxide, vegetable magnesium stearate. Standardised Momordica charantia Fruit Powdered Extract, Cellulose Gum, Alpha Lipoic Acid, Fenu Greek, Green Tea Leaf Powdered Extract, Glazing Agents: hydroxypropylmethyl cellulose, vegetable glycerin (from palm kernel oil and coconut oil), Zinc, Niacin, Vitamin B6, Antioxidant (powdered blend of L-Ascorbic acid and beta-carotene), Chromium. 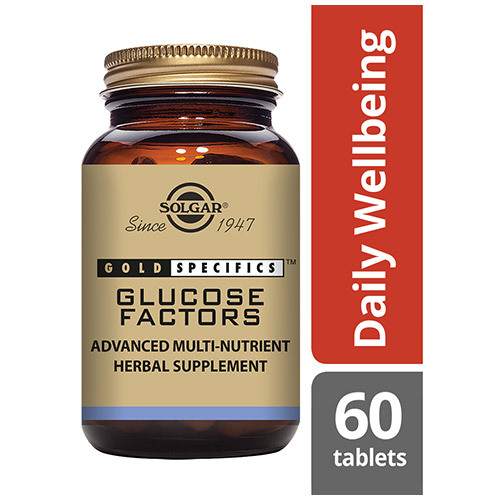 Below are reviews of Solgar Gold Specifics Glucose Factors - 60 Tablets by bodykind customers. If you have tried this product we'd love to hear what you think so please leave a review.